Legislator Anker Promotes Volunteer Opportunities at Mount Sinai High School. Mount Sinai, NY - November 9, 2018 - On Thursday, November 8th, Suffolk County Legislator Sarah Anker attended the Mount Sinai High School Honor Society Volunteer Fair. In order to imbue a sense of community and caring for others, the Honor Society hosted the event to get encourage students to get involved in volunteering. The two-day volunteer fair allowed students to explore different opportunities that meet their interests and abilities. 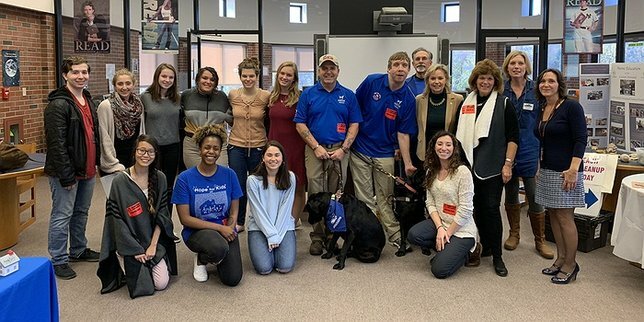 Many local nonprofit organizations attended, including Coastal Steward, Angela’s House, Long Island Museum, Guide Dog Foundation, Long Island Exploratorium, America’s VetDogs, and Mount Sinai Heritage Trust. For more information about volunteer opportunities in the community, please call Legislator Anker’s office at (631) 854-1600. Subject: LongIsland.com - Your Name sent you Article details of "Legislator Anker Attends Mount Sinai HS Honor Society Volunteer Fair"